Review posted November 19, 2018. Kids Can Press, 2016. 36 pages. Here’s an easy-to-understand guide all about the microbes that live in your microbiome. I was impressed, because the terminology and the knowledge is different than when I was a kid. 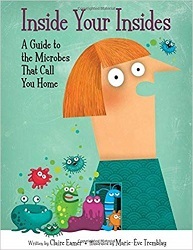 The book talks about good bacteria and bad bacteria – but also talks about several other kinds of microbes, including archaea, viruses, fungi, protists, and mites. The book is illustrated with large cartoons, and has many “Did You Know?” spots on the sides, as well as silly jokes punning on “cell” or “germ.” It’s clearly written and informative, and I was somewhat embarrassed by how much I learned. If you want to attract lots of different microbes to your microbiome – and generally, you do – here are a few steps you can take. Play outside. Explore the natural world. Keep pets. Eat lots of fruits and vegetables. All of these activities will add variety to your microbiome and help it stay balanced and healthy…. Scientists are looking at ways to encourage the growth of microbes that are good for us. They even hope to find ways to cure diseases by restoring healthy microbiomes in people. But it’s complicated. Everyone has a different microbiome, and the difference is big between people who live in very different parts of the world or live different kinds of lives. Besides, not all microbes are friendly. It isn’t easy to figure out which ones will live together well and which won’t. Still, researchers are working on some interesting ways to improve your microbiome or fix it if something has gone wrong. How about a cream that nourishes the helpful bacteria on your skin? Or foods that nourish the good bacteria in your gut and encourage new microbes to settle there? An informative and interesting look at the tiny creatures that call you home.